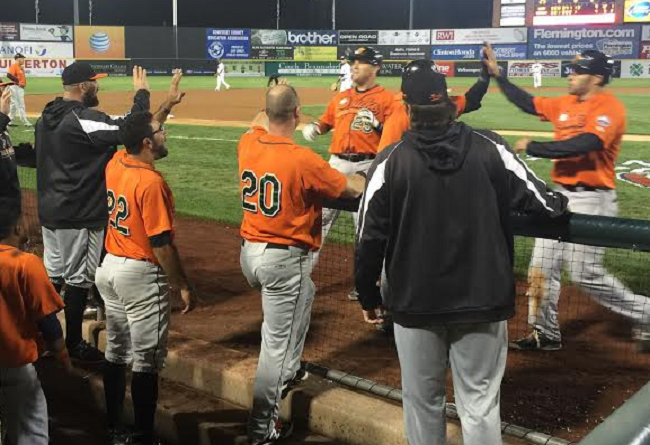 The Long Island Ducks defeated the Somerset Patriots 9-4 on Friday night in Game Three of the 2015 Liberty Division Championship Series at TD Bank Ballpark. The Ducks now lead the best-of-five series two games to one. Both sides exchanged zeroes until Aharon Eggleston hit a two-out solo home run to right field in the bottom of the third inning off of Ducks starter Bobby Blevins. The Ducks answered with four runs in the fifth, all with two men out, against Patriots starter Matt Zielinski. A RBI single by Sean Burroughs, a RBI double by Dan Lyons and a two-run single by Cody Puckett did the damage. Lew Ford grounded a two-out RBI single up the middle in the sixth, extending the advantage to 5-1. Michael Burgess hit a two-run homer to right-center in the bottom of the sixth, but a two-out RBI double by Mike Blanke in the seventh stretched the Ducks’ lead to 6-3. David Vidal trimmed the gap to 6-4 with a pinch hit RBI single in the bottom of the seventh, but a splendidly-turned 6-4-3 double play ended the threat. Long Island responded with three more runs in the eighth to balloon the lead to 9-4. Randy Ruiz’s two-run double, and a sacrifice fly from Burroughs highlighted the frame. Blevins (1-0) earned the win, tossing six innings, allowing four runs on four hits and three walks while striking out seven. Zielinski (0-1) suffered the loss, surrendering four runs on seven hits and four walks with four strikeouts in five innings. Three Ducks relievers combined for three scoreless innings to seal the win. Puckett led the Flock with four hits, while Burroughs and Fehlandt Lentini each added two. The Ducks and Patriots continue the best-of-five Liberty Division Championship Series with Game Four on Saturdaynight. Game time is slated for 7:05 p.m. at TD Bank Ballpark. Right-hander Bruce Kern toes the rubber for Long Island against Somerset righty Will Oliver. Fans can follow all of the action live on the Ducks’ flagship radio station, 103.9-FM LI News Radio.